Bungee Football is a fun and exciting game where players are trying to score in their opposition’s goal while attached to a bungee cord, limiting their movement. Our Bungee Football is played by two teams of two who are trying to score in the oponents goal while being restricted to their half of the football pitch. 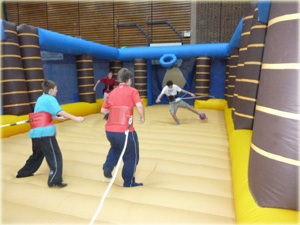 We always provide a member of staff to run and referee our Inflatable Bungee Football (Red and Yellow cards included!) 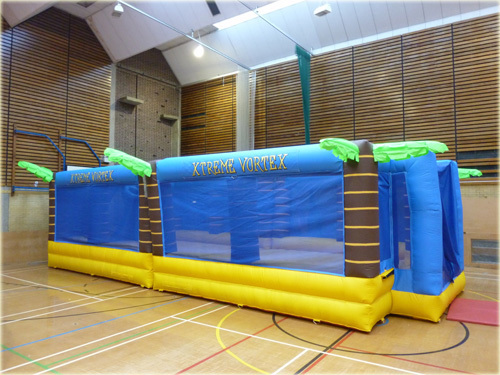 to ensure the activity is run smoothly and safely for your event. Our staff are fully trained, have enhanced CRB disclosures and a first aid trained operator will be present at your event.